When most people think of the word “challenging,” they think of synonyms like “cumbersome,” “daunting,” or “stressful.” Not us. Here at Simplus, we are aggressive critical thinkers. We take on challenging projects the same way a five-year-old would take on an entire cake before mom finds out. We excitedly rub our hands together and dive in face-first, loving every minute of it. We love cake too. Our clients’ complex challenges are our passions. If you’re a creative person, and a cloud computing junkie, Simplus is the sandbox for you. We encourage each other to play around and come up with truly innovative and amazing solutions. We love creativity! For an event in Vegas, we designed a deck of playing cards, each with a different reason you’d need CPQ implementation. It was a winner! People loved that we steered away from the boring one-page flyer. You know that feeling you get when you reach out for thoughts and get tons of great feedback from colleagues who genuinely care and are excited about your project? You don’t? Well, that’s probably because you don’t work at Simplus, where each of us is a steward. We’re fresh on the enterprise scene, and we’re growing fast, which means we’re not stuck in our ways. We love input from our team. We want to bring in people who want to contribute, share their knowledge, and grow our awesomeness. At Simplus, you’re not only a CRM expert, but you’re also a voice. And we hear you. Do you have a burning, inner desire to solve complex problems and fulfill your client’s needs? At Simplus, we take complex problems and turn them into Simplus solutions. I mean . . . simple solutions. 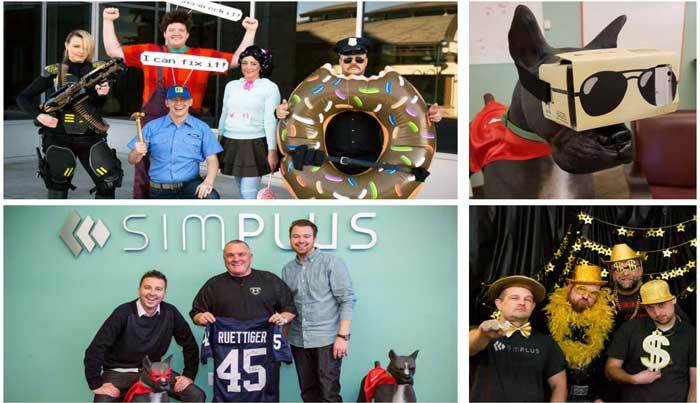 Everything about Simplus is simple, except for our employees, of course. Wink, wink. Are you like a shark—if you stop swimming, you’ll drown? Are you the type of person that is always looking for something new to do? Well, we never have a dull moment at Simplus! Each day brings new and exciting opportunities that will keep you intrigued and engaged. Get ready—your little sharky fins will be the most ripped in all the seven seas. At Simplus, we work hard and play harder. Your best friend invited you to join her for a cup of coffee at the local cat cafe? Purrrfect. Have tickets to see your favorite German polka techno musician at 10 a.m. on a Wednesday? Go shake your tailfeathers! If you do your job and you do it well, we embrace niche hobbies! Are you a foodie with a taste for exotic cuisine that could rival Anthony Bourdain’s culinary prowess? Or perhaps you just like to douse all of your food in nacho cheese. Whichever you are, you’ll never go hungry with the help of our fully-stocked breakrooms! Here’s to eating whatever the heart desires. We’re the youngest of system integrator partners (#underdogs), but we are the ones leading all the neighborhood kids on epic quote-to-cash adventures! At Simplus, we’re growing at an unprecedented rate while keeping our CSAT high, and we are excited to be taking the challenge head-on. So, grab your sneakers and your bicycle and let’s go explore the exciting world of cloud tech together!